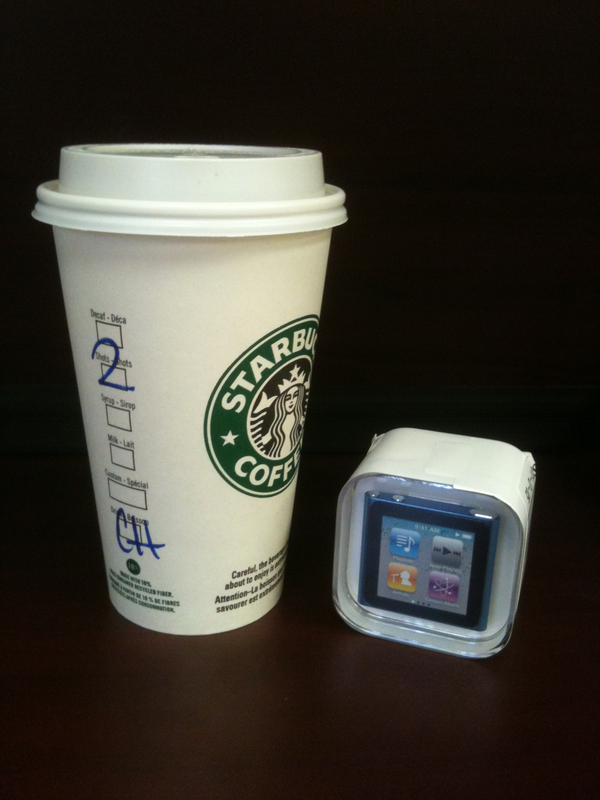 These items just struck me as having a great photogenic and blogging potential: my Filthy Chai Grande; and, a brand new Apple iPod Nano. The picture was taken with my iPhone and uploaded via the WordPress app. I used my Starbucks card to pay for my Chai, it was pre-loaded earlier this week. The hand-written drink order on the side of the cup just looks so naturally part of the design, its as though the cup was printed just like it appears. Quality penmanship is becoming more and more rare in these days of digitality that when you come across fine example such as this one it should be shared. Also to note, Starbucks in Canada also offers free wi-fi to everyone. My wife and I used Airmiles to get the iPod Nano for our daughter, Jackie. It arrived at my desk this morning; I had not thought about seeing it anytime soon as the confirmation suggested it would be two to three weeks before we would see it. It’s soooo small! … and, it still has a serious “cool” factor about it. Besides, we had to do something with all those airmiles.